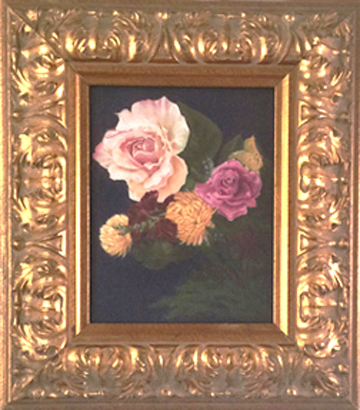 Exquisite “Flowers in Paradise” Gold Framed miniature Archival Digital Canvas Re-creation reflects the original Pastel Painting I created. Miniatures are intriguing art since the framing can dictate the style. “Flowers in Paradise” Gold Framed stretched canvas takes on an antique look of years ago because of the heavily carved gold frame yet the art is ageless. Reminiscent of the Venetian painters who used dark mostly black backgrounds to highlight magnificent flowers I decided to use Dark Royal Blue as modern rendition framed in Old World Antique Gold. Finding these beautiful unforgettable Flowers was a surprise. After visiting a client from Ocala Florida much to my surprise I found an Equestrian Jumping Competition in progress. Awestruck by the horses, the riders, magnificence of the grounds I noticed at the end of the course, the last fence, was a triple high pristine white jumping fence decorated at the side posts with the most opulent gorgeous flowers to beautiful not to take them into my heart and create a pastel painting “Flowers in Paradise” Gold Framed. They were so incredible I never wanted to forget them. Creating the large Rose was crucial for the painting to be a success. Highlighting the flowers against the Dark Royal Blue Background was slow working with the dark pastels surrounding the other colors. I only created this one miniature “Flowers in Paradise” Gold Framed Archival Digital Fine art piece on canvas.